When U.S. President Barack Obama visits Vietnam later this month, he will find it has been making reforms that have transformed the communist economy, turning the country into one of the world's fastest-growing nations. A report from the International Monetary Fund said Vietnam has achieved "commendable" economic outcomes, with strong growth, low inflation and robust foreign direct investment. “Vietnam is a remarkable development success story. In a short time, the country has charted a course of rapid, inclusive growth, delivering higher living standards for the majority of its people," World Bank President Jim Yong Kim said recently in Hanoi. Kim said less government involvement in the economy helped growth. 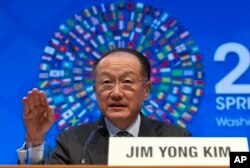 FILE - World Bank President Jim Yong Kim speaks at IMF headquarters in Washington, April 16, 2016. Kim said the nation still needs to improve its workforce, take care of the environment, and govern in a more transparent way. But he said years of strong economic growth are a lesson for the rest of the world. He said Vietnam is relying instead on "markets to allocate resources, and active engagement with the world on trade, investment and knowledge flows." However, many analysts, and Vietnam's government, said more work is needed to cut corruption and improve infrastructure and worker training. Credit rating agency S&P said Vietnam's relatively low income and some uncertainties about its evolving economic policies could make it harder to weather a future economic downturn; but, S&P applauds Vietnam’s “robust” growth potential and movement toward more complex and profitable kinds of manufacturing. Strong potential economic growth has apparently outweighed the incomplete reforms for some foreign investors who see a profitable future in Vietnam. GE is among the multinational corporations investing in Vietnam in the hope of manufacturing things to sell in this growing market of more than 90 million people and elsewhere, said Wouter Wersch, president and CEO of GE in ASEAN. “The main opportunities that we see from our side is power generation, both coal but also gas. And a lot of renewables, wind is coming up strongly, and hydro has always been very strong in the country," Wersch said. "There's of course also the transmission of the electricity that needs to be worked on and where we have the solutions," he added. FILE - Laborers work at a garment factory in Bac Giang province, near Hanoi, Oct. 21, 2015. Vietnam's textiles and footwear would gain strongly from the Trans-Pacific Partnership, after exports of $31 billion last year for brands such as Nike, Adidas and H&M. GE's 900 employees in Vietnam are also involved in making high-tech health care devices and taking care of jet engines for local airlines. The firm is expanding its investments in the country. An expert on development in Vietnam said a stable political environment is one reason it is easier for companies to operate there than in some other emerging markets. But Indiana University professor Anh Tran said corruption in Vietnam is "very significant" and may take a decade to get under control. “The government is experimenting with different ways to deal with that. I think in the end Vietnam will be able to reduce corruption significantly, but the process will take significant time," he said. Tran spoke in a Skype interview and said major companies have the bargaining power to cope with corruption, but smaller firms are more vulnerable to demands for illegal payments. He also said the Vietnamese workforce is diligent and easy to train, but that the nation could attract more investment – and jobs – if it better prepared workers for technical jobs.